A fast foot passenger catamaran ferry Krilo Jet belongs to UTO Kapetan Luka ferry company that is based in Krilo Jesenice, near Split. 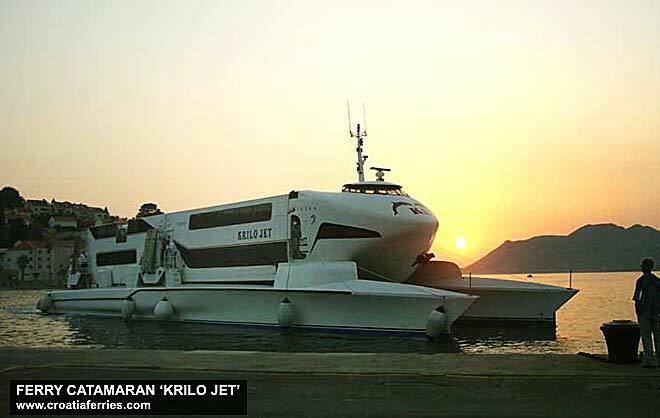 The Krilo Jet catamaran is 43 meters long and 10.85 meters wide with speed of 34 knots. It has a capacity of 398 passengers. The ferry, which was constructed in 2002 in France, was acquired by Kapetan Luka ferry company, Croatia in 2007. Krilo Jet is currently serving Kapetan Luka’s ferry route 9608, connecting ferry port Korcula with Prigradica, Hvar and Split.